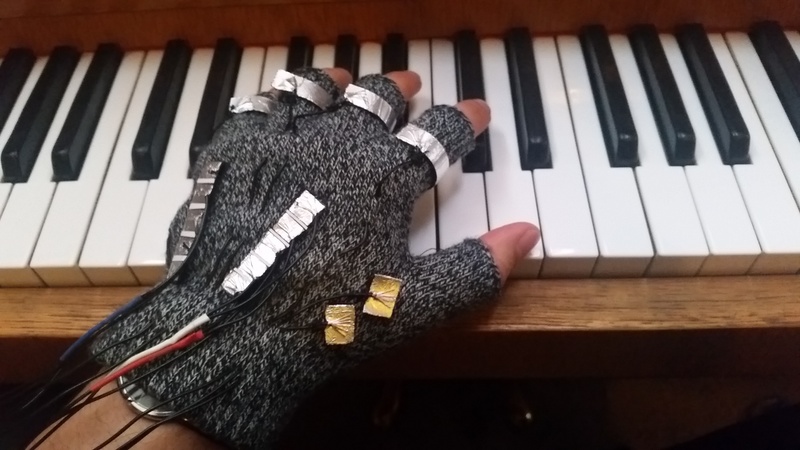 GloveFX is a glove-based tangible interface, which aims to bring some of the versatility of modern electronic instruments to their acoustic counterparts and allows for intuitive real-time manipulation of sound, independent of origin, for both creative and educational purposes. It can be used to toggle effects that are applied to the sound signal and regulate some of their parameters. 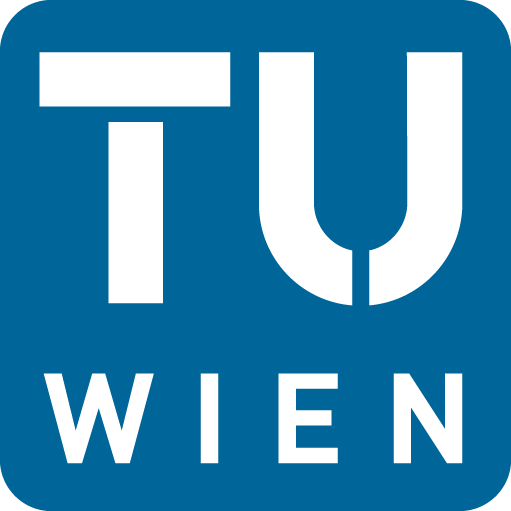 Furthermore it facilitates the recording of a desired output and real-time monitoring during its creation. 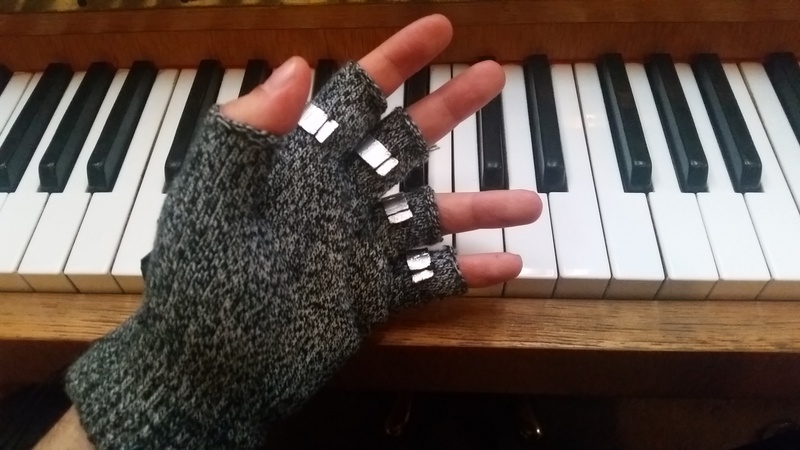 Individual effects can be turned off by using the buttons on the fingers, which can either be accessed by the glove-hand on the inside by thumb, or by the other hand at the back of the glove. Alternatively all effects may be toggled off by touching the button nearest to the thumb. The adjacent button is used to start/stop recording of a session. Lastly there are two sliders placed lengthwise on the back of the hand. The left one for regulating output-volume (recording volume is not affected) and the right one for changing effect-parameters, depending on the effect it is applied to. 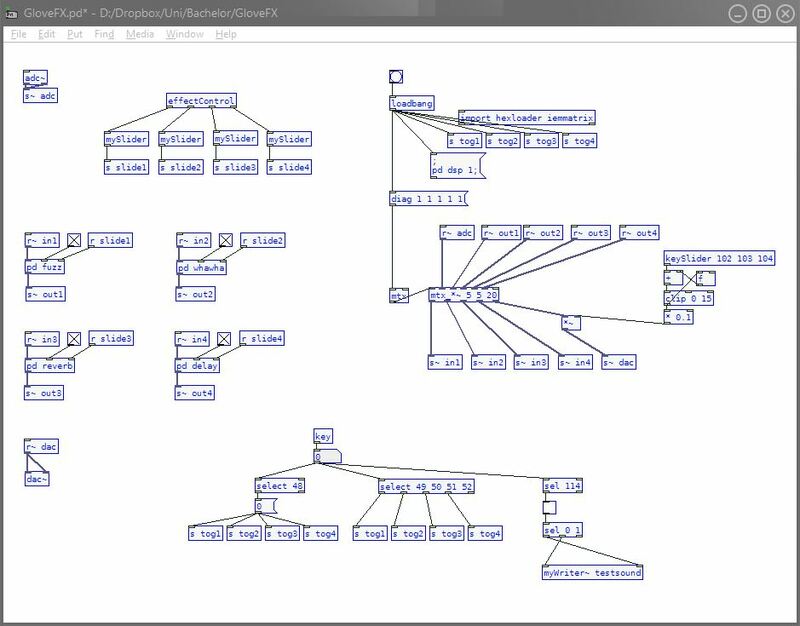 The Software for GloveFX is based on Pure Data (Pd), an Open Source Visual Programming Language, that allows the User to process a wide variety of signals like audio, video and MIDI. Programs written in Pd are called patches. The main patch of the Pd program for the project serves as the main class. It is where the input and output of the program and the interaction between the sub-patches is handled. It also allows for audio-recordings in the form of 16-bit WAVE files. The basic audio-input starts as an analogue signal from an external source, such as a microphone, is picked up by an Analogue-Digital-Converter and is then put through a multiplication matrix, which in turn feeds the simple input signal to the various effect-patches. In these effects patches the signal is modified and fed back into the matrix, which finally returns the multiplied, modified signals and passes them on to a Digital-Analogue-Converter. The signal is then received by an audio-output device, such as a pair of headphones. Installing Pd-extended is recommended for running it on most plattforms. For recording the path in myWriter~ should be set to the desired location.